I've ended up a couple of days behind with my posting. My father-in-law died on Saturday morning and the weekend was spent with family and friends. We hosted the open house yesterday so I have spent the weekend on my feet and am very glad to have a day today when we can just rest and relax before the funeral. It feels a little odd to launch from that intro into the our weekly rhythms, as if I should take a day or two on a different subject, but I’m going to stick with the original plan! This is a bit of a long one, hope you still enjoy it! When I had just one child, routine wasn’t something I craved. In fact, I was glad to just wing it each day and was not a mother who wanted her child in a set routine. In fact, the thing I (probably still) find hardest about kids is the need to have food at set times. I’m a snacker and would happily eat dinner at 8pm or lunch at 2pm but unfortunately children want and need fed constantly and meals at the same (early) times each day. I found it really restrictive once Daniel was on solids properly and we had to have lunch at 12ish and dinner at 5.30ish every day. Anyway, all until I read my parenting book favourite – Simplicity Parenting. This is THE book. Like it’s fabulous. I tried to make notes the first time I read it, but essentially was rewriting the book out! I digress, this great read talked about rhythm. It talks about how in our modern society the idea of a typical day has largely gone and we lose out without them both in providing our children consistency and security. Children really benefit from the fact they can depend on daily rhythms and it is one of the most powerful ways of simplifying children’s lives. There is security in having things that are predictable every day. It doesn’t mean a strict routine and we do have days (particularly multiple appointment days) that aren’t part of the normal rhythm, but we do try and keep our weeks simple with daily habits and the boys can now tell me what we will do each day when I say what day it is. - on weekdays the boys get dressed straight after the breakfast, on weekends we take it slow and unless they ask to get dressed we keep them in their pyjamas until mid morning! - keeping weekends very quiet when we can. We have five days a week where we need to get up and out – Colin to work and Daniel to school so we try to not commit to too much on weekends. Church is at 11am on Sundays and on Saturdays we normally have no set plans. We don’t tend to do parties. There are no extra activities during the week like swimming lessons, or mini rugby or even BB or Scouts. For now, school is enough structure in Daniel’s life and we keep life away from school simple. Mondays – Rory is in daycare most Mondays, we started this last winter in order to let me get a few hours to write as I had a contract piece of work on the go and had no time to do it, then I did a course on educating children with Down Syndrome (along with some help from my mum in order to get the course finished in time). I also use it to do some much needed housework and decluttering. Rory enjoys the fact they have little mini scooters and bikes that he can use and he gets to paint and play with water! Tuesdays – we go to a local mums and tots group which starts at 9.30 so straight after the school run and is only a few minutes walk from our house (though Rory made it a thirty minute walk one week recently as we stopped for so many “I see a cat” interactions, watching a digger, watching men replace a roof on a house, pulling leaves off hedges – you know the type of walk. But how lovely that we are able to spend the time dandering at toddler speed. Wednesdays – I host our mums bible study for mums with young children at home. There’s around 10 mums and more children that come to ours for prayer, Bible study, coffee and cake while the children play together and find hidden packets of biscuits. I love that this teaches Rory about hospitality (not my greatest strength) and it’s great for us both to spend time with our church family. 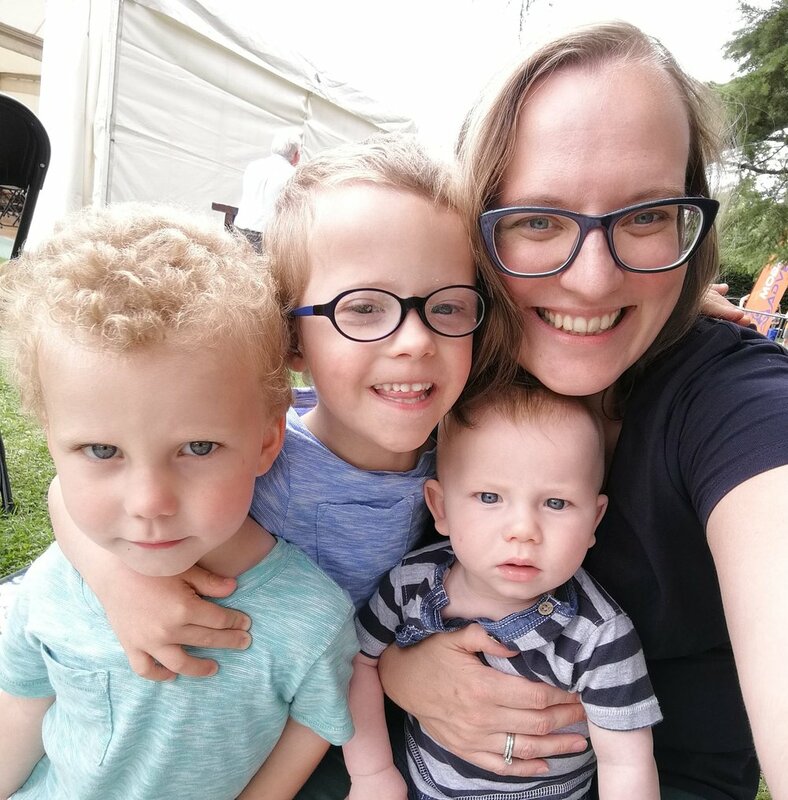 Thursdays – this is our flexible day as for some reason a lot of clinics fall on Thursdays (my antenatal appointments, Rory’s dietician clinics and Daniel’s respiratory clinics are all Thursdays). Those weeks without appointments we either go to our church mums and tots group or I take Rory to a toddler gym session to burn off that desire to hang and swing and jump from high places! Fridays – we stay around home most Friday mornings. Most weeks we have a volunteer from Homestart who comes to help me with medical and statementing paperwork – she plays with Rory and has a chat with me about what’s been happening medically and behaviourally with Daniel in particular and gives me some advice and a listening ear. It’s fab. The weeks she doesn’t come Rory and I might do some messages or go to Ikea for breakfast and to watch the planes landing. In the afternoons Daniel has some quiet time (if not an actual nap) then the boys have a table top activity (playing a board game, or doing colouring or sticker books); free play with each other (this is fabulous to watch, they both are bringing each other along with different aspects to their play); helping with dinner prep (stirring the pot or helping cut vegetables) and some TV (I have strict rules – no cartoons!) while I make dinner. We light a candle when dinner is on and have a Bible story. Little rhythms in our day that mean the boys know what to expect and life feels safe and simple, secured in home, helping us all flourish. What do you do to ensure there is a simple rhythm in your children’s lives or what might you start (or stop!) doing?